Different cell types exhibit distinct physiological behaviors during post-exodontic repair. In this period, alveolar bone repair goes through several phases in which cellular and tissue changes are expected. The resorption of the alveolar bone in height and width is indirectly dependent on the presence of teeth. After tooth extraction, resorption in the vestibular-lingual width is greater than the visible resorption in height of approximately 2 mm. Planning the quantity and quality of resorption can determine the type of prosthetic rehabilitation to be achieved. The guided bone regeneration technique seeks to select the cells producing bone tissue by means of a physical barrier. These totipotent cells differentiate and are the major responsible for the secretion of the extracellular matrix that will be mineralized. A case of post-extraction polypropylene membrane is presented, with prospects for future osseointegrated implant and prosthetic rehabilitation. After removal of the membrane, which remained for 10 days, maintenance and immobilization of clot was observed, maintaining a relative thickness of the alveolar ridge. The use of polypropylene membrane, through guided bone regeneration and potentiation of the osteopromotion phenomenon, may be an important adjunct in the treatment of post-extractive alveolar sites for implant-prosthodontic rehabilitation. The polypropylene membrane showed predictability, with lower morbidity for the patient and lower patient costs. Bioengineering, Bone regeneration, Dental implants, Wound healing. Despite the technical and scientific advances of contemporary dentistry, even today, tooth extraction is frequent in the daily practice. Caries, fractures, periodontal diseases, iatrogenies, unsuccessful therapies, prosthetic failures, persistent pathologies, malocclusions, automobile and / or sports accidents, neglect of oral health, orthodontic indications, among others - all these factors cause dental mutilation (1). After tooth extraction, alveolar bone repair begins dynamically. 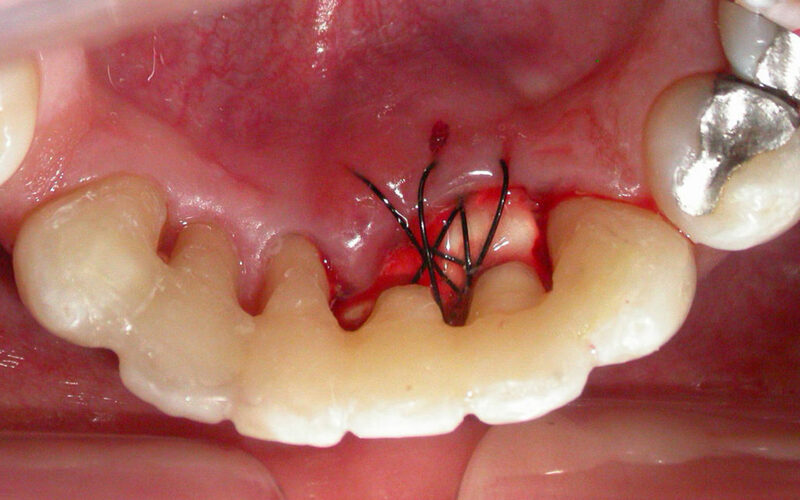 The clot left by the extravasation of blood, after the rupture of the vessels present in the periodontal ligament and the nervous-vascular bundle, carries a series of cellular types, which carry proteins, responsible for genetic information for bone production. The morphogenetic bone proteins, present in blood platelets, signal the primordial sites for the initiation of extracellular matrix mineralization and the subsequent production of the trabecular framework of bone tissue (2,3). Given the rapid colonization of epithelial cells and the expected clot retraction, part of the conical cavity space left after extraction of the dental root will be occupied by epithelial and connective tissue cells. This connective tissue forms a granulation tissue in which there is intense vascular proliferation (angiogenesis), necessary for revascularization and local tissue nutrition. After a few days, the totipotent or pluripotent cells differentiate and the new osteoblasts, as well as the existing ones, secrete a matrix that can mineralize (4,5). The guided bone regeneration technique seeks, through a physical barrier, the containment of cell types undesirable to the alveolar bone repair, favoring the immobility of the osteoblasts in the proliferative alveolar site. The osteoblasts, precursors of bone tissue, can emit pseudopodia by installing and initiating the process of secretion of the extracellular matrix that will later mineralize. From osteoid tissue to maturation, in a few months, it will culminate in the formation of concentric lamellae, with Havers and Volkmann channels, with adequate nutrition, which makes the tissue susceptible to the maintenance of the functional activities resulting from masticatory loads, provided that a detailed prosthetic rehabilitation with satisfactory reverse planning is achieved (6). Several materials were tested and used as a barrier, among them: castor, polytetrafluoroethylene and even gold screens (7). However, the results achieved are conflicting and little accessible to daily clinical practice (8,9). The purpose of this paper is to present a case on the use of post-extraction polypropylene membrane, with perspective of future installation of osseointegrated implant and prosthetic rehabilitation. A male patient, melanoderm, 44 years of age, attended our private clinic requiring periodontal treatment and tooth extractions. 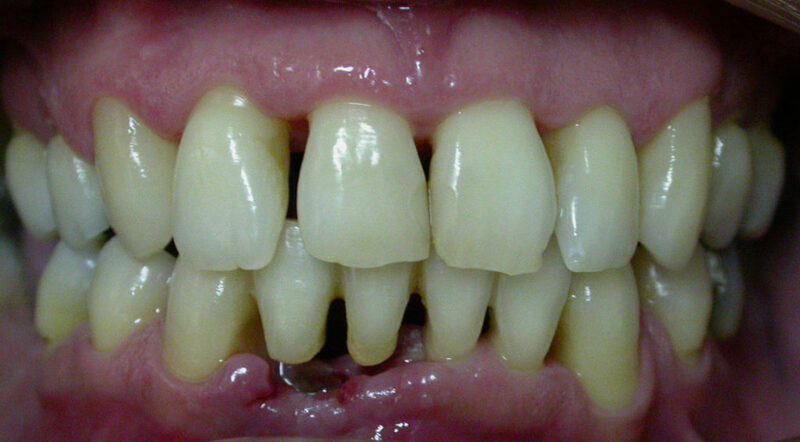 Clinically, generalized chronic periodontitis was observed (Figure 1), with marked mobility on teeth 25 and 26. 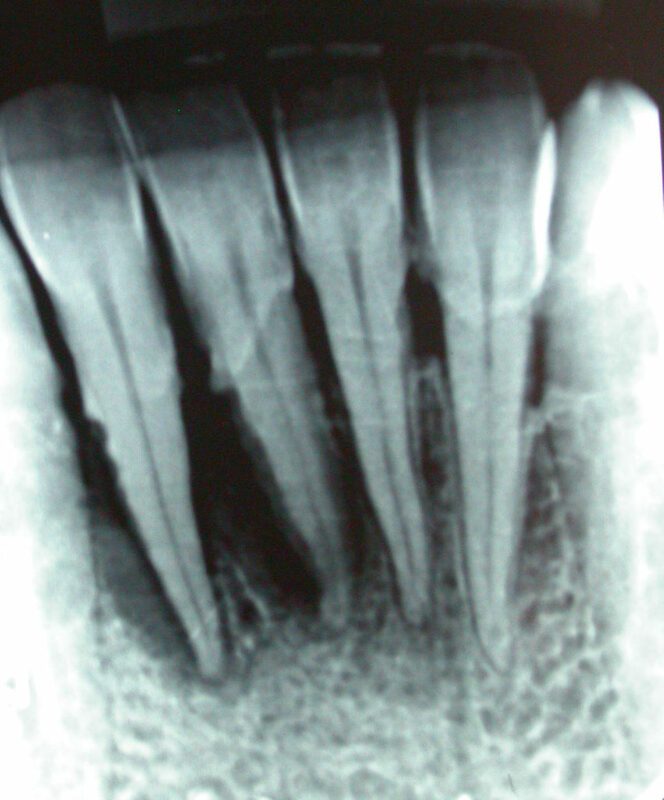 Figure 1 Initial intraoral image: generalized chronic periodontitis and marked mobility of teeth 25 and 26. Radiographs showed dental losses (teeth 3, 14, 18, 19, 30 and 31), bone loss in generalized alveolar ridges and radiopaque images suggestive of dental calculi on teeth 25 and 26 (Figure 2, 3). 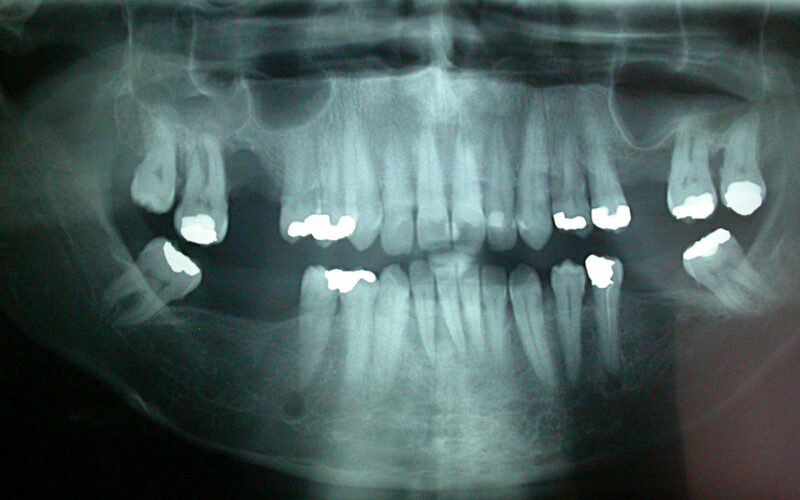 Figure 2 Initial radiograph showing dental loss and generalized bone loss. 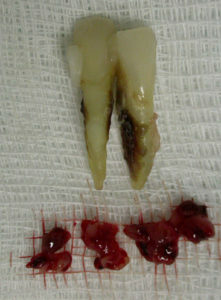 Periodontal treatment was performed (Figure 4) and extractions of teeth 25 and 26 were indicated. However, with the future prospect of inserting osseointegrated implants and prostheses, the use of regenerative techniques (Guided Bone Regeneration) was suggested. After the patient's consent, the use of the polypropylene membrane was recommended. Computed tomography showed hypodense areas related to advanced bone loss in the region of teeth 25 and 26 (Figure 5, 6). After the extractions, with subsequent curettage of the socket and abundant lavage and irrigation with saline solution (Figure 7, 8), the polypropylene membrane (Bone Heal®, INP, São Paulo, Brazil) was cut, adapted, inserted and sutured. The membrane was intentionally exposed in the oral cavity (Figure 9, 10). It was temporarily kept in place with the dental crowns, carbon fiber and composite resin, in order to help both aesthetics and function (Figure 11). Analgesic, anti-inflammatory and antibiotic drugs were administered post-surgically. 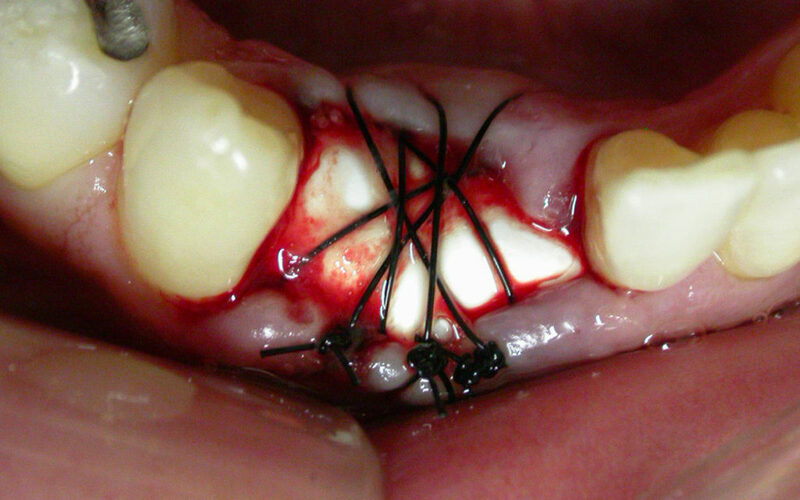 At 10 days postoperatively, the remaining sutures and the membrane were removed (Figure 12, 13). No postoperative changes or complications were observed or reported. Clinically, maintenance and immobilization of the clot were observed, maintaining relative thickness of the alveolar ridge (Figure 13). The patient was referred for the subsequent installation of osseointegrated implant and prosthetic rehabilitation after 3 months, for the restructuring of the remaining ridge. In the post-extraction period, a physiological and determinant clot retraction occurs, originating from the salivary enzymes and from the indigenous microbiota of the oral cavity. Local hemostasis initiates a series of cellular and tissue phenomena common to physiological repair (10). The fibrin screen interconnects the walls of the alveolus, giving a yellowish and gelatinous appearance to the site. First-line cells of organic or immune defense, like neutrophils, try to prevent the invasion of bacteria from the buccal environment. Salivary immunoglobulins and epithelial growth factors also aid in the neutralization of these invading microorganisms (2). The endostium and the periodontal ligament, three days after the surgical act, provide differentiated and undifferentiated cells, contributing greatly to the cellular colonization of the granulation tissue that forms towards the center of the alveolar socket left after the extraction (1,3). Four days after the procedure, malformed trabeculae of primordial bone filled the defect. Its restricted function confers only a filling without intending to undergo more intense mechanical efforts, such as more vigorous mastication (11,12). At seven days, angioblastic proliferation forms in the alveolar center; and, in the osseous cortical walls, adult or secondary bone tissue interposes to the granulation tissue (2,3). At three weeks, there is complete isolation between the postoperative alveolus and the oral cavity. In the apico-cervical sense there is formation of secondary bone. Up to 35 days, new osteoblasts are formed from osteoprogenitor cells, with osteoid tissue being secreted. At 45 days, connective tissue permeated by mature bone tissue with irregular trabeculae is formed. Osteocytes are trapped in the adult bone tissue (13). At 4 months, bone tissue is considered morphologically compatible with more severe mechanical stresses and consistent with the onset of more reliable prosthetic rehabilitation. Normally, the healing time after surgery of 4 months for the maxilla and 6 months for the mandible is necessary when planning implant-supported rehabilitations (14). Even pre-prosthetic surgeries must be planned based on terminal bone maturation (15,16). The importance of the immobility of the clot in the alveolar bone rehabilitation after the surgical procedure is emphasized. 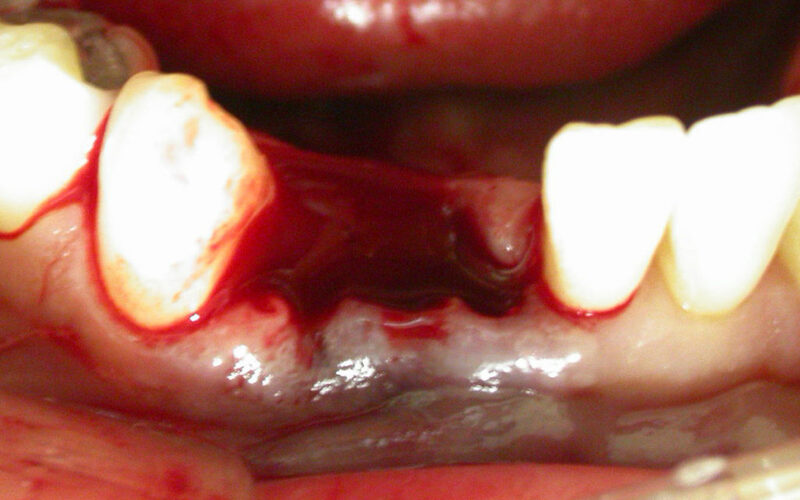 Thus, bone sequestration, restorative material remains, surgical wound infections, abrupt increases in local temperature above 47° C for a time greater than 1 minute (causing protein denaturation and minimization of alkaline phosphatase), untimely movements of the flap or traumatic removal of sutures, among others, delay alveolar repair (17). Autogenous bone grafts are considered the gold standard in cases where replacement and filling of sites is necessary. Bone substitutes have been developed with the purpose of saving surgical time and avoiding a second surgical stage together with the increased morbidity for the patient (24-27). Membranes have made it possible to keep the grafts in position, since the periosteum does not always reach adequate containment due to extensive bone defects. 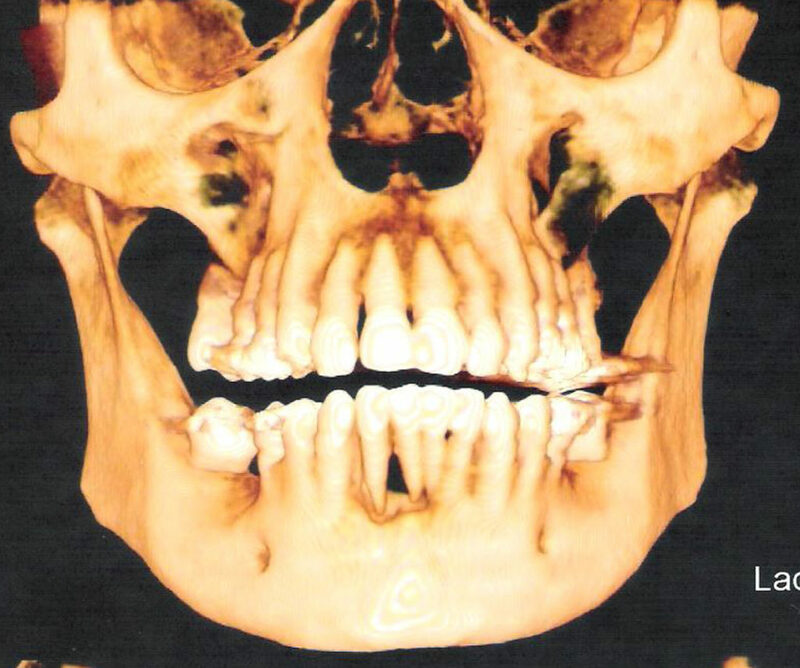 Surgeries of maxillary sinus, correction of bone defects due to trauma or periodontal problems, augmentation of aesthetic areas after extraction or periodontal surgeries with connective tissue grafts and apposition of blocks or particles of autogenous bone require membranes or barriers as a means helping bone repair (28-30). Membranes of various types of material have been employed in the technique of guided bone regeneration and they all must have some characteristics for their ideal use: easy to be cut and shaped; adaptability; mechanical resistance compatible with applied loads; malleability; low cost; unnecessary additional resources; possible exposure to the oral environment without promoting infection; unnecessary relaxing incisions; and possible removal without the use of drill bits or punch instruments. The polypropylene membrane used in the presented case fulfilled the majority of the desired requirements as well as the task of osteopromotion (18). The polypropylene membrane potentially has numerous advantages, such as: its intentional exposure to the buccal environment; the flaps may be kept apart from each other for second intention healing; there is no need of using granular biomaterials within the alveolus, only blood clot; no complementary instruments are required; no need of previous hydration, as it is dimensionally stable during the period of stay in the surgical site; being waterproof; it can be removed between 7 and 14 days; without adherence to scar tissue; the inner surface promotes adsorption of osteoblasts and precursor cells; it can be used in cases of immediate implants by the Schroeder Technique with also immediate load, allowing the simultaneous regeneration of bone and inserted gingival tissue; hindering the accumulation of dental biofilm and food debris (19-23). Within the scope of contemporary dentistry, which prizes maximum preservation and minimal intervention, the guided bone regeneration technique with membrane aid is considered as an effective alternative in osteopromotion and osteogenesis. The barrier selectivity characteristic, by histologically competent cells for the production of bone tissue, in the region of the post-extraction alveolus, protects the clot, potentiates local physiology and supports greater contribution in the reverse planning, aiming at the more reliable prosthetic rehabilitation, with better prognosis and longevity (27-28). The potentiation of alveolar bone repair through guided bone regeneration concentrates the basis of the osteopromotion phenomenon. Thus, treatments of periodontal defects, alveolar sites after dental extractions, maxillary sinus lift and desired increases of the alveolar ridge are common clinical-surgical procedures in which guided bone regeneration is employed. The practice of using bone substitutes and allogeneic, xenogenic and alloplastic grafts requires longer clinical time and greater cost for the patient. The physico-chemical characteristics of these bone substitutes provide parameters, such as: crystallinity, contact surface and compositional constitution. These factors lead to loss of control of bone repair rates as well as the amount of degradation of these biomaterials over time. More predictable treatment options, with lower morbidity for the patient, with consequent reduction of costs, are required. Puricelli E. Técnica anestésica, exodontia e cirurgia dentoalveolar. First ed. Artes Médicas: Sao Paulo (Brazil); 2014. p.160. Consolaro A. Reparação óssea, alveolar e peri-implantar: compreendendo a osseointegração! In: Consolaro A. Inflamação e reparo. Second ed. DentalPress: Maringà; 2015. p.307-42. Marzola C, Abreu EM. Processos de reparo alveolar. In: Marzola C. Técnica exodôntica. Second ed. Pancast: Sao Paulo; 1994:303-26. Araújo MG, Sukekava F, Wennström JL, Lindhe J. Tissue modeling following implant placement in fresh extraction sockets. Clin Oral Implant Res 2006;17:615-24. Araújo MG, Wennström JL, Lindhe J. Modeling of the buccal and lingual bone walls of fresh extraction sites following implant installation. Clin Oral Implant Res 2006;17:606-14. Salomão M, Cunha J, Morales RJ, Siqueira JTT. Regeneração óssea guiada com barreira de polipropileno intencionalmente exposta ao meio bucal. Rev Catarinense Impl 2012;12:65-8. Salomão M, Junior POT, Fonseca MB. Caso clínico - Regeneração óssea guiada utilizando barreira de polipropileno (BoneHeal®), associado a enxerto xenógeno (BIO-OSS®) e enxerto de tecido conjuntivo, otimizando a reabilitação com implante dental. Rev Catarinense Impl 2016;18:42-4. Borges FL, Dias RO, Piattelli A, Onuma T, Cardoso LAG, Salomão M, Scarano A, Ayub E, Shibli JA. Simultaneus sinus membrane elevation and dental implant placement without bone graft: A 6-month follow-up study. J Periodontol 2011;82:403-12. Salomão M, Alvarez FK, Siqueira JTT. Regeneração óssea guiada em defeitos extensos pós-exodontias utilizando membrana exposta ao meio bucal. Rev Implant News 2010;7:753-9. Salomão M, Siqueira JTT. Uso de barreira de polipropileno pós exodontia. Relato de três casos clínicos. Rev Bras Impl 2009;15:12-5. Salomão M, Siqueira JTT. Regeneração óssea guiada através de barreira exposta ao meio bucal após exodontias. Rev Bras Impl 2010;16:5-7. Lacerda EJR, Lacerda HM, Salomão M. Invaginação de tecido conjuntivo após levantamento do seio maxilar, uso de biomateriais e implante tardio: resolução cirúrgica em um caso clínico. Rev ImplantNews 2012;9:843-50. Ley J. Minimally invasive extraction and immediate implant placement: the preservative. J Oral Impl 2006;32:204-5. Schropp L, Kostopoulos L, Wenzel A. Bone healing following immediate versus delayed placement of titanium implants into extraction sockets: a prospective clinical study. Int J Oral Maxillofac Implants 2003;18:189-99. Botticelli D, Berglundh T, Lindhe J. The influence of a biomaterial on the closure of a marginal hard tissue defect adjacent to implants: an experimental study in the dog. Clin Oral Implant Res 2004;15:285-92. 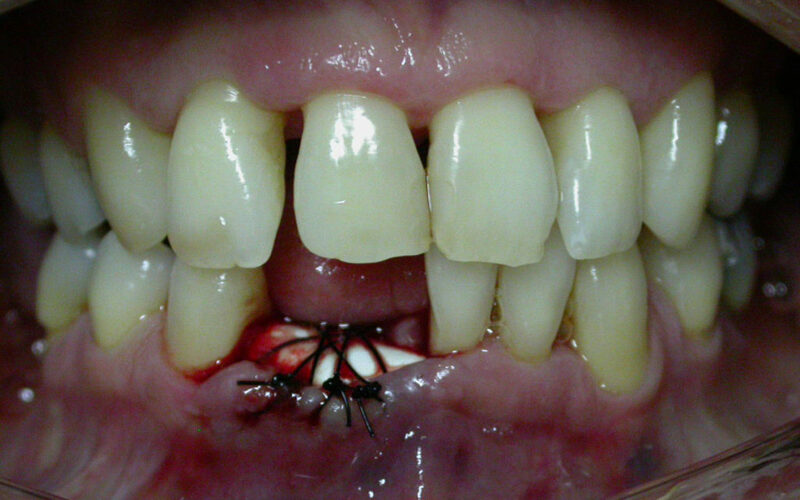 Nemcovsky CE, Moses O. Rotated palatal flap. A surgical approach to increase keratinized tissue width in maxillary implant uncovering: technique and clinical evaluation. Int J Periodontics Restorative Dent 2002;22:607-12. Salama M, Ishikawa T, Salama H, Funato A, Garber D. Advantages of the root submergence technique for pontic site development in esthetic implant therapy. 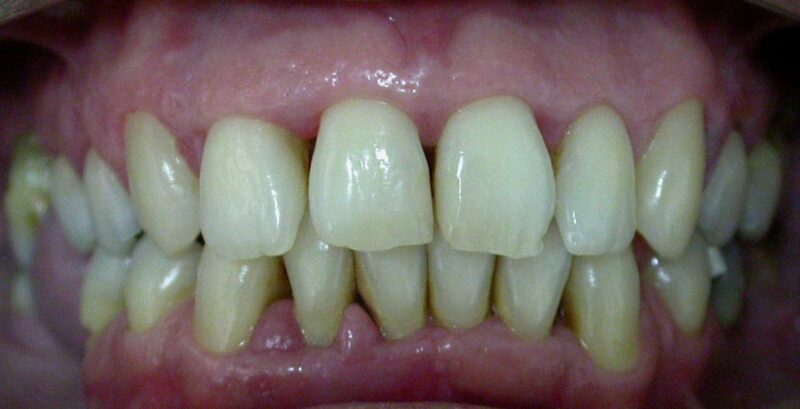 Int J Periodontics Restorative Dent 2007;27:521-7. Carvalho PSP, Ponzoni O, Bassi APF. Manutenção de volume do processo alveolar após exodontia com raspa de osso cortical autógeno. Rev Implant News 2004;1:53-8. Lacerda EJR, Lacerda HM. Regeneração óssea guiada por meio de membrana não-absorvível pós-exodontia. Rev Implant News 2010;7:87-92. Sohn D, Moon J, Lee W, Kim S, Kim C, Kim K, Moon Y. Comparison of new bone formation in the maxillary sinus with and without bone grafts: immunochemical rabbit study. 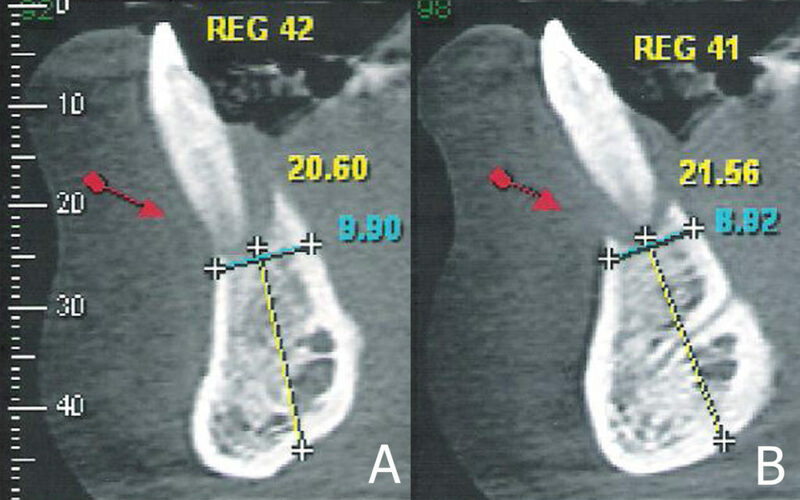 Int J Oral Maxillofac Implants 2011;26:1033-42. Garcia RP, Ferezin PHV, Kfouri FA. Manutenção alveolar pós-exodontia com membrana de polipropileno e fibrina rica em plaquetas e leucócitos (L-PRF). Rev Paul Odontol 2017;40:18-23. Salomão M, Siqueira JTT. Recuperação do rebordo alveolar através de barreira exposta ao meio bucal. Novo paradigma? Rev Catarinense Impl 2010;10:26-8. Salomão M, Siqueira JTT. Uso de barreira exposta ao meio bucal para regeneração óssea guiada após exodontia. Rev Assoc Paul Cir Dent 2010;64:184-8. Zeppini LAS. Barreira de polipropileno - Uma nova abordagem para regeneração óssea guiada (ROG). Rev Odontol (ATO) 2014;14:301-7. Silva BCR, Salomão M, Siqueira JTT. Regeneração de defeito ósseo extenso pós-exodontia para instalação de implante osteointegrável com uso de barreira intencionalmente exposta ao meio bucal. Relato de caso. Rev Catarinense Impl 2013;13:54-7. Caplanis N, Lozada JL, Kan JYK. Extraction defect: assessment, classification and management. 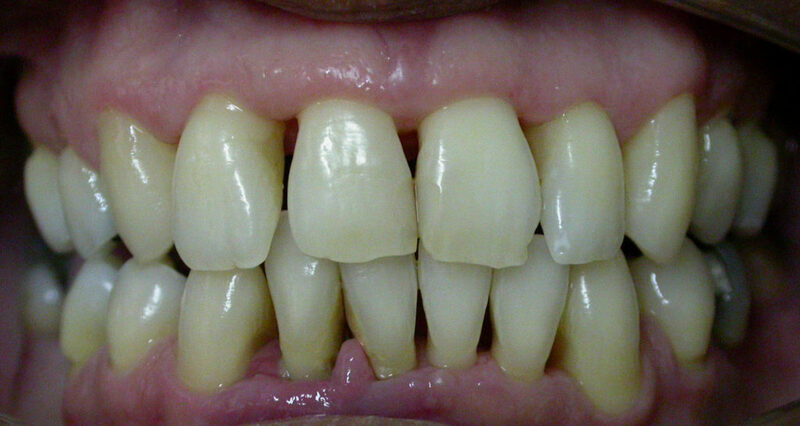 Int J Clin Impl Dent 2009;1:1-11. Nevins M, Camelo M, De Paoli S, Friedland B, Schenk RK, Parma-Benfenati S, Simion M, Tinti C, Wagenberg B. 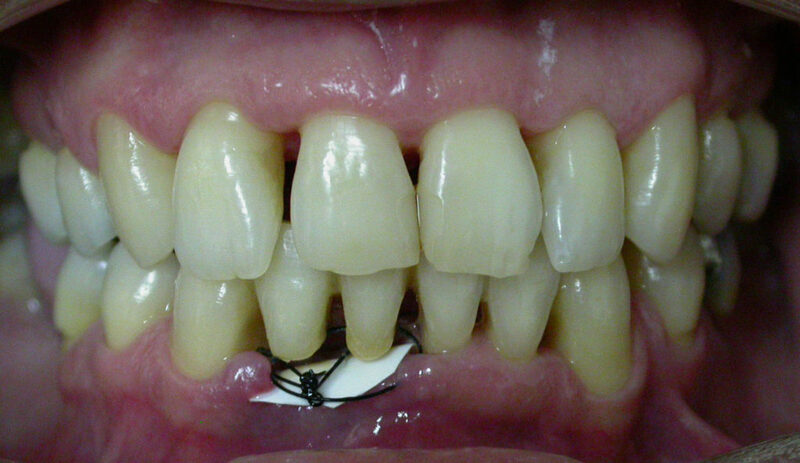 A study of the fate of the buccal wall of extraction sockets of teeth with prominent roots. Int J Periodontics Restorative Dent 2006;6:19-29. 30. Fickl S, Zuhr O, Wachtel H, Stappert CFJ, Stein JM, Hüerzeler MB. Dimensional changes of the alveolar ridge contour after different socket preservation techniques. J Clin Periodontol 2008;35:906-13.